Share your HDMI video to multiple TVs or monitors with HDMI input. 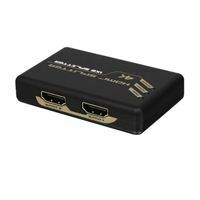 Setup is fast and easy-just plug-in the HDMI cable (not included) from your video sources HDMI output to the video splitters input and connect each TV or monitor to the splitter directly and you are all set. AHS02F has a high bandwidth of 340MHz to support high quality video and resolution of up to 4000 x 2000. It is also daisy-chainable to support more TVs or monitors. This is great for trade shows, seminars, and stores.